If you’re anything like me, you appreciate the finer things in life: the blue resin channels of a pine needle, the hairs on a fly’s foot, the carpospores of an algae, the cilia of a rotifer. For some of the most beautiful photographs I’ve seen of the micro-world, visit the Micropolitan Museum of Microscopic Art Forms. 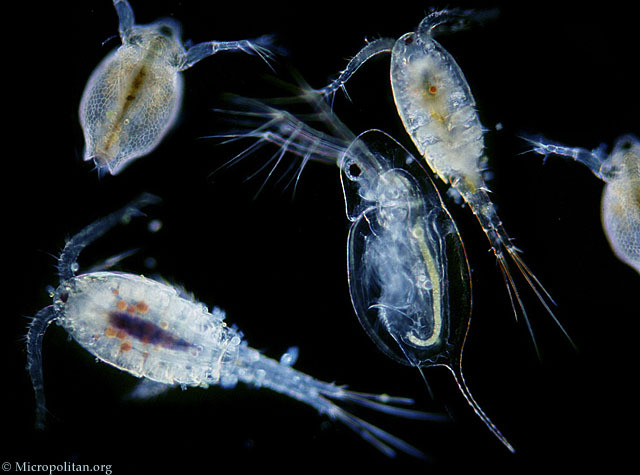 This website, presented by the Institute for the Promotion of the Less Than One Millimetre, is the creation of artist and curator Wim van Egmond and highlights the microscopic art of the ocean, freshwater, insects, and plants. While you’re there, be sure to stop by the Hall of Arthopods and the Water flea Circus, but don’t go into the Bacteria Basement – that’s where all the trouble organisms hang out. For those readers lucky enough to live in the Eastern Hemisphere (Europe, Africa, Australia and Asia), you’ll have a treat on December 31st – the last lunar eclipse of the year. Lunar eclipses occur when the Moon passes through the Earth’s shadow. The more central the moon in the shadow, the more total the eclipse. This eclipse, known as a minor partial eclipse, won’t be too spectacular – just a tiny sliver of the Moon (~7.6%) will go dark as it passes through the Earth’s shadow. However, no matter where you live, we’re all in for another treat this New Year’s Eve, something that only happens once in a blue moon. What’s that? A Blue Moon. Today, the expression “blue moon” has two meanings: (1) something rare and (2) two full Moons occurring in one month. However, those meanings have changed over time (the last 400-ish years, to be exact). 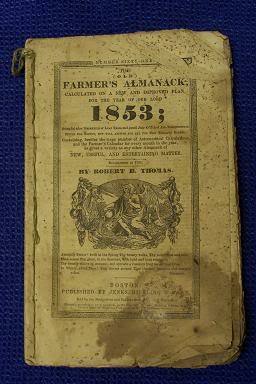 The earliest recorded use of the phrase “blue moon” happened in 1528, in a pamphlet criticizing the English clergy. The line, “Yf they say the mone is belewe/We must believe that it is true” (If they say the moon is blue, we must believe that it is true), was used to describe an impossible event. By the 18th century, the phrase “until a blue moon” was used to mean “never.” So why, today, do we used the expression “once in a blue moon” to mean something that happens every now and then, or rarely? Well, it turns out the moon can appear blue. When the Indonesian volcanic island Krakatoa erupted in 1883, the particles of ash it shot into the atmosphere were around 1 micron wide, the right size to scatter red light while letting other colors pass through. Sunsets looked green and the Moon looked blue all around the world for almost two years. Blue Moons could happen. A similar phenomenon happened in 1927 when an extra-long dry season created enough dust in the air for a blue Moon in India, and in 1951, smoke from forest fires in Canada turned the Moon blue over North America. So when I say that we’ll see a blue Moon this Thursday, am I psychically predicting a forest fire or volcanic eruption? Happily, no. Besides, if I had psychic powers, I’d want to know lotto numbers, not the color of the Moon. So, why are there two full Moons this month? 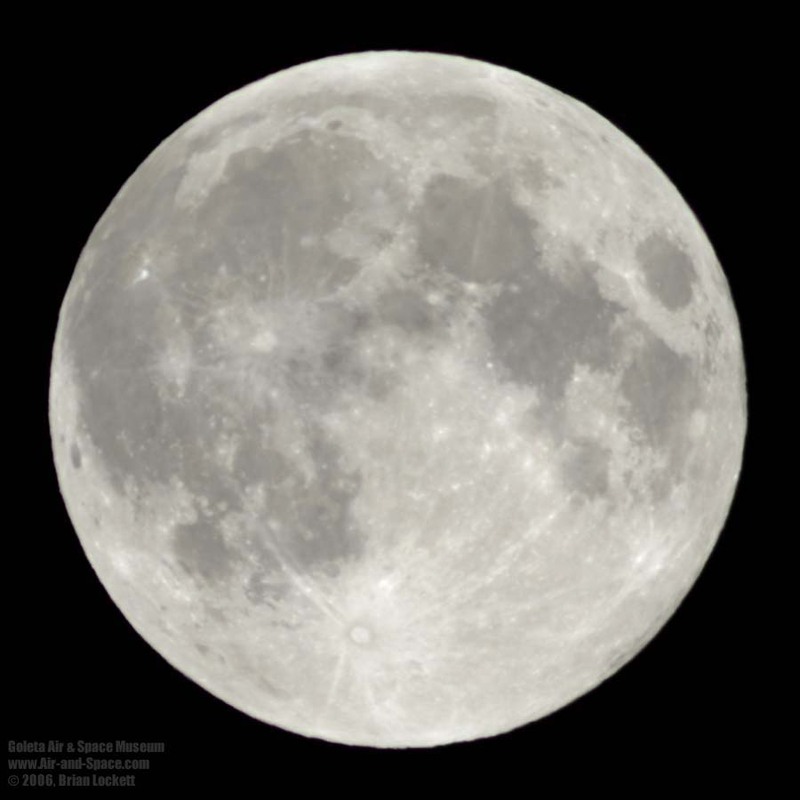 We usually only have one full Moon per month because there are 29.53 days between each moon. However, get a month that’s long enough (31 days) with a full moon happening early enough (this month the first one happened December 2nd), and you can have two full Moons in one month. The definition of a “Blue Moon” as something rare still holds up, too, since these double Moons only occur once every 2.7 years. Science at home: Who did I see? I rarely see or even hear one of my favorite animals, and, no, that’s not because I love elephants and can only see them in a zoo or on safari (which is a highly unlikely trip for me anyway). No, this critter is a native of Colorado but it’s a nocturnal carnivore with such specialized adaptations that even sensitive-eared prey animals like mice don’t hear it coming. So imagine my surprise when on an evening a couple of weeks ago, sitting in my car at a stoplight west of Windsor on 392, with the temperature hovering at 0º F, my favorite animal, an owl, emerged from the blackness of the night, flying slightly above the intersection right over my car! Just enough light was emitted from my headlights and the street lamps to cause its light-colored belly feathers and under-wings to faintly glow in the night. It was beautiful! My mom, another bird-lover, was with me. We’ve been debating about what species of owl we saw. It was a large owl but I’ve certainly seen larger. I’d guess it had a wing span of 3 feet. Great Horned Owls (Bubo virginianus) have a wing span range of 3 to 5 feet, and a wide range of color variation, but a white belly is one possibility. 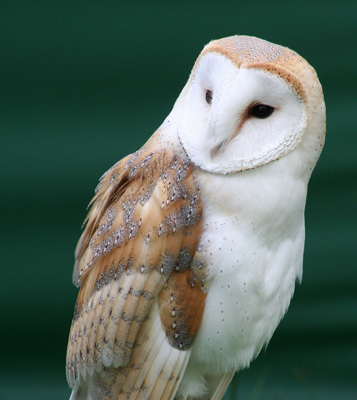 Barn Owls (Tyto alba) all have white bellies, with a wing span of 3 to 3.5 feet. We could have seen a small Great Horned Owl or an average-sized Barn Owl. In flight, the feathers on its head that give the Great Horned its “horned” appearance, are folded against the head, so that diagnostic feature was not visible to us (if it was a Great Horned). Barn Owls have distinctive heart-shaped faces, long legs and a squared tail but in all honesty, this sighting occurred so fast and in such dim light I didn’t really catch anything of those features. That said, I’m leaning towards Barn Owl simply because the owl, including its face, looked so white to me. Barn Owls are often called “ghost owls” because they are so eerily silent in flight and their faces and underbellies are so pale. I’m hoping we might see this owl again sometime. Owls are creatures of habit: they have roosts and hunting grounds they return to over and over again. You can spot these locations not by spotting the owl (my goodness, owls are hard to spot!) but the cough pellets and whitewash they leave behind over many, many visits to the same favored haunt. It’s possible my mom and I crossed the regular evening route of a hunting owl. I’m going to time my trips down 392 and keep my eyes open! If you ever have a chance to go on an “owl prowl” with a professional ornithologist, I highly encourage it. An owl prowl is a late night walk through an area where owls live. By using their own voices, or sometimes tape recordings or calls, these owl experts can call to owls that will sometimes respond with calls of their own or even a flight in to see what’s up. Owl prowls are not for the impatient, nor are they for cold-weather-averse folks. The best prowls I’ve been on are at 10 pm in freezing weather (less than 30º F) – shout out to Jerry Garden of the Chicago Audubon Society – thank you for all the prowls you lead that I attended while I lived in Chicago! Be prepared to be amazed and totally surprised by the sight of the feathered hunter who sneaks up on you. I once saw a great raptor naturalist and educator, Ryan DePauw, formerly of Spring Brook Nature Center in Illinois, illustrate the sound a single hawk feather makes when flapped, versus the sound of an entire owl’s wing when flapped. There’s no comparison: the single hawk feather sounds like a herd of elephants tap dancing with the Rockettes, while the owl’s wing didn’t make a sound at all. One thing I will never, never do is call an owl myself. If you call different species of owls in the wrong order, you will either fail to hear or see any owls, or worse, you may cause the death of a small owl. 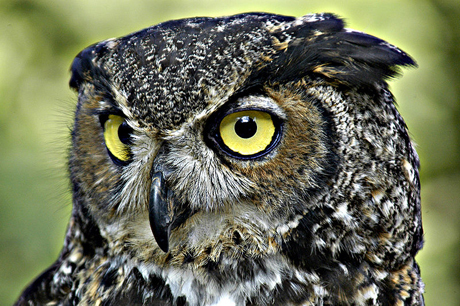 Great Horned Owls eat smaller species of owls, like saw-whets and screech owls. I would hate to call in a screech owl only to draw the attention of a Great Horned! The best Fort Collins-area resource for learning about owls is the Rocky Mountain Raptor Program. Their mission is to rehabilitate and return to the wild injured and sick raptors, including owls. Some birds that cannot be released are used for educational programs. Check out their website: www.rmrp.org. See if you can identify the Great Horned Owl and the Barn Owl in the pictures on their homepage! 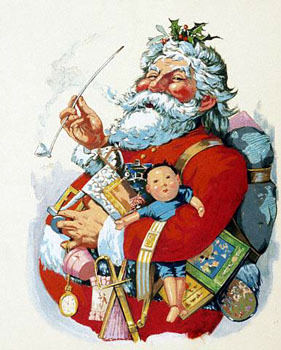 As the holiday season gets into full swing, you may be looking for ways to make your celebrations a little “greener.” Sure, you could do the usual eco-friendly festivities: use LED lights, have a real tree grown on a sustainable tree farm that you will recycle after the holidays, and re-gift those presents you didn’t want (hey, it’s almost the same as recycling…), but if you really want to be an winter eco-warrior, I have just five words for you: Electric Eel-Powered Christmas tree/Hanukkah Menorah/Kwanzaa Kinara (it’s still sort of five words – go with it). The electric eel, Electrophorus electricus, is in fact a fish, not a true eel, but it is quite electric. Three abdominal organs, the Main organ, Hunters organ, and Sachs organ, take up approximately 80% of the animal’s body and work something like batteries connected in a series. The organs are made of electrolytes, or electric cells, lined up so that an electric current can flow through them and produce an electrical charge. These organs give the electric eel the ability to generate both low and high voltage electric discharges that can stun and even kill other organisms. 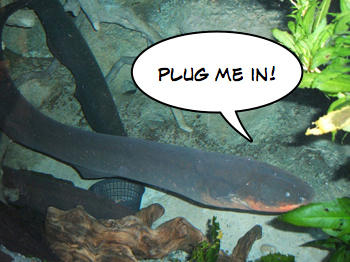 While the primary purposes of electric eel discharges are for echolocation and communication (weak discharges) and predation and defense (strong discharges), their ability to power holiday decorations may open up a whole new niche for these animals. While this may sound like science fiction, its fact and it’s happening in Japan at the Enoshima Aquarium. Since almost every neat new electronic gadget from Japan eventually becomes popular here, I say let’s jump on the eel bandwagon now.